Added expansion — Dragons of Tarkir. Added recent Dragons of Tarkir promo cards. March 2015 Oracle card text update. March 2015 Comprehensive Rules update. March 2015 Magic Tournament Rules update. March 2015 Infraction Procedure Guide update. Added expansion — Khans of Tarkir. Added Khans of Tarkir promo cards to database. Legality updates for September 2014 format rotation. September 2014 Comprehensive Rules update. 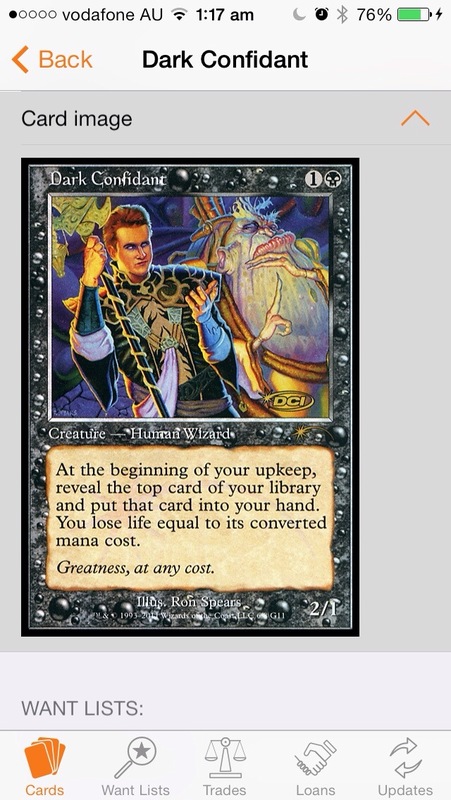 September 2014 Magic Tournament Rules update. September 2014 Infraction Procedure Guide update. September 2014 Judging at Regular REL update. MTG Trades 2 is a new app, why? Yes, version 2 is unfortunately a new app. This decision was forced by last-minute advice from Apple regarding a new iCloud/CoreData sync implementation in iOS 7. We were told not to mix pre-iOS 7 clients with iOS 7 clients, at least if we want stability and reliability. I would have preferred to release this as an update to the existing app, and in fact I had betas of this with my beta testers right up until the point I got this advice from Apple. I originally planned the iOS 7 update to this app to be a free update like with my other app, MTG Guide. But I have lots of iCloud apps that were updated just fine to new iOS 7 interfaces, what gives? iCloud is really three technologies — A key-value store for storing preferences (which works very well), a document sync used by iWork apps (which mostly works well), and a database syncing framework not used by any Apple apps but used by MTG Trades (which has had many issues). This year at the developer conference we were told they were aware of the issues with the database sync (iCloud+CoreData) and asked us to give them a second chance saying they’d really rearchitected this for iOS 7. The implementation of iCloud+CoreData *is* much much better in iOS 7. You’ll immediately notice some things like not having to wait for iCloud to initialise all the time when opening the app, and being able to add data to the app straight away after the first launch. Also syncing is a lot more robust. The downside, is that the app on iOS 7 really needs to start with a complete clean slate for syncing. Why are you charging for the new app? Couldn’t you make it free for a short time? I can’t afford to make it free and gain a lot of new users whom I then have server and support costs for. Why can’t you offer free upgrades or upgrading pricing for new app? Sadly the App Store doesn’t support upgrade pricing, and there is no way to make it free for just existing users. Hence, MTG Trades 2 is currently half-price for a while to allow existing users to get it a bit cheaper, and I’ve advertised it everywhere I can to existing users (in MTG Trades 1, Twitter, Facebook, mtgapps.com). Can’t you give promo codes to existing users? I can and have given out some to people who bought the old app really recently, but I can’t offer these to everyone. Apple only give us a small set amount for each new app version, so it it just not feasible to offer these to all existing MTG Trades 1 users. What else am I paying for in MTG Trades 2? While MTG Trades 2 currently looks similar feature-wise to the last version, apart from the redesigned interface, it has many under-the-hood improvements and many, many bug-fixes. I’ve been working on pretty solidly since June, and there has been around 200 commits totalling over 30,000 lines of code changes. A *lot* of work went into version 2, so hopefully the $2.99 doesn’t seem unreasonable in light of this. Also, the new look is not automatic, a lot of time and effort went into that. Will future updates be free, or will have future paid upgrades? I don’t plan to have future paid upgrades. I will continue making improvements to MTG Trades 2, and releasing these as free updates. Couldn’t you just upgrade the old app to have the iOS 7 look without changing the sync? This is not possible. In order to get the new look code must be built against the iOS 7 SDK (Software Development Kit) which in turn changes the behaviour of the iCloud sync engine, causing potential issues, even with no code changes on my side. What will happen to MTG Trades 1? You can continue to use it on both iOS 6 and iOS 7, it just looks a little out of place on iOS 7. I will continue to release database updates for it and support the price database updates. I just won’t be adding new features to it any longer. Why is MTG Trades 1 still in the store? 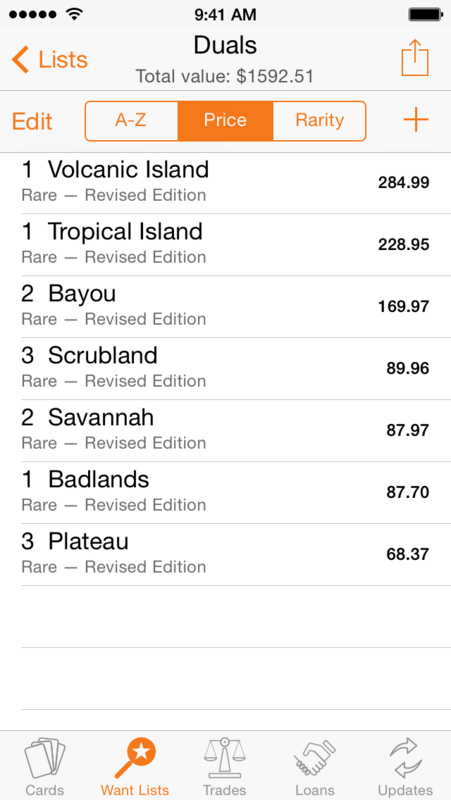 It is still in the store because if I remove it then people who have purchased it will no longer be able to update to the latest version and export their data to MTG Trades 2. I have put a big notice on it saying “don’t buy this” and raised the price to a stupid level. Nobody has bought it since then. I wish I could remove it from the listings, but I can’t if I still want people to have access to the updates. Again, another limitation imposed by Apple. MTG Apps is just one person. I work on these apps in my spare time. I don’t make masses of profit from them. I release many free feature improvements and database updates for new sets. I have ongoing server and support costs, even though you spend a one-off fee for the app. The sales pay for my time and costs but this isn’t even close to being a full-time income. I do it mainly because I wanted these apps myself, I love Magic, and I get a kick out of hearing about other people who use and love the apps. I’m sorry if this move angered you. I really felt I had my hands tied. Hopefully after reading this you understand my reasons for doing this. Please feel to email me with further questions. MTG Trades 2 has finally been released. It is available at half-price for a limited time. New app, redesigned for iOS 7. New stable and reliable iCloud syncing implementation. Faster ‘All cards’ search interface. Add import of user data from MTG Trades 1.11. Over 50 additional bug fixes and stability improvements. Why no iOS 7 update for MTG Trades? 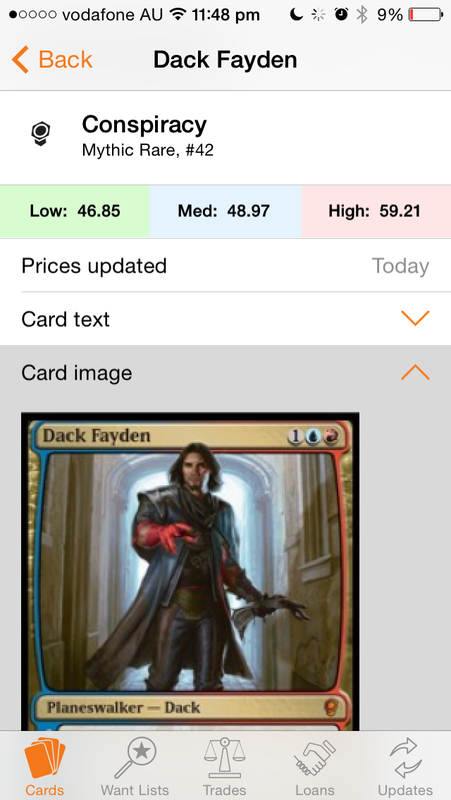 You may have noticed that MTG Guide got an interface update for iOS 7, and MTG Trades didn’t. The interface updates for MTG Trades are actually ready, but Apple have rearchitected their iCloud syncing implementation, and I’ve just found out it is not safe to release an update built with the new interface and iCloud implementation if people have old devices or data created using iOS 5 or 6. This didn’t show problems in testing, but someone from Apple has just advised that it is a very bad idea and could cause all manner of problems later. It looks like I will be forced to release a new app, MTG Trades 2, which will be iOS 7 only. (I will keep releasing free database updates for the last version of MTG Trades). I am currently testing the sync in the new version and am looking into ways of importing people’s existing data. This is less than ideal, but will result in better and reliable syncing of people’s data and fix all the iCloud related problems people have encountered.